(Nanowerk News) Spintronics is a discipline called to change the way we store and manage digital information by using the spin of electrons. Metal complexes showing spin-transition (i.e. reversible interconversion between different isomers) are among the best candidates for the preparation of molecular memories and spintronic devices. A major bottleneck for the use of these compounds in such high-added value applications is however the lack of reliable methodologies for their integration into solid materials, which often leads to detrimental effects on the optimal switchable properties shown in solution (e.g. loss of the interconversion capabilities). The research Group led by CSIC Prof Daniel Ruiz at the ICN2 publishes in Advanced Functional Materials ("Liquid-Filled Valence Tautomeric Microcapsules: A Solid Material with Solution-Like Behavior") a universal encapsulation method to integrate those compounds into solid materials keeping their useful properties unaltered. Although some successful examples of the incorporation of these complexes into micro/nanoparticles and liquids crystals have been reported during the last years, the approaches employed are rather specific and hard to be expanded to other active compounds and types of material. As such, a general and scalable strategy enabling direct transfer of spin-transition behaviour from solution to the solid state is yet to be developed. 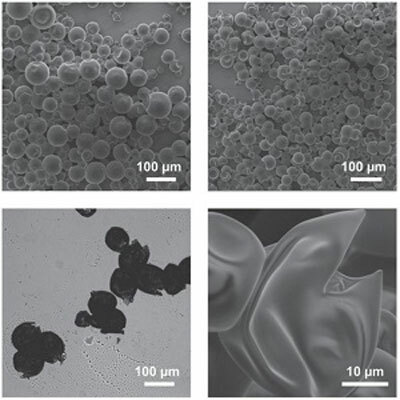 In this contribution the ICN2 researchers have successfully faced this challenge by means of a simple, versatile and universal approach, which consists in the confinement of the metal complexes of interest into liquid-filled polymeric capsules. The present study demonstrates that this methodology meets the most important conditions required to integrate spin-transition into functional materials: (1) it leads to solid microstructured materials that perfectly reproduce the well-established properties of complexes in solution; (ii) it allows fine tuning of the switchable behaviour by merely replacing the solvent used in the encapsulation process; (iii) it enables incorporation of spin-transition into any final solid matrix of choice by simple dispersion of the liquid-filled capsules. All these features, in combination with its simplicity and the lack of synthetic modification of the complex, makes this strategy very appealing for the future fabrication of solid functional materials based on spin transition materials.